Mills Display is your one-stop shop for retail product display and shop fitting needs. Our diverse catalogue covers over 3,000 products. We have solutions for every type of retail environment in New Zealand. Our sales force team are experts in retail display solutions & visual merchandising. We will find the perfect solution for your business. 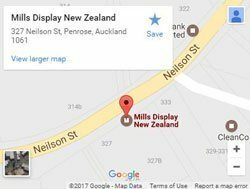 Mills Display is uniquely placed in New Zealand to be the first choice for visual communication and production presentation for the retail environment. A national experienced sales force with a complete commitment to getting results for our customers, no matter what! Mills Display has a dedicated inventory of everything required to ensure your business is fully kitted out. Our international network of suppliers ensures we find the perfect display solutions & visual merchandising for your business. When we say, we are a one-stop shop for retail product display and shop fitting, we mean it. Our 3,000+ catalogue means that our customers find everything they need for their business. Our excellent customer service team are experts in finding the best solutions for businesses. Contact our team today and we will find the right products for your business. Complete our online contact form or call 09 634 5962.